Since my last update, we’ve been super busy at Champ towers. We’re all very excited about the imminent opening date which is now only a month away, when we’ll have actual Champers staying in our churches! How exciting! We launched our new churches on the website on 12th January and since then the bookings have been flooding in. We know that many of you were waiting to see what the new sites would be like before booking and we hope you haven’t been disappointed. 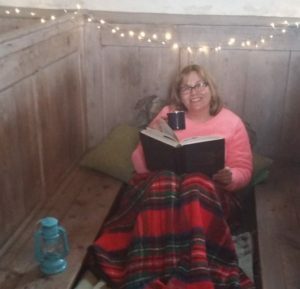 I’ve been busy travelling around the country and talking to anyone who will listen about how amazing compost loos are and of course Champing™ in general. We finally finished our photography sessions after being snowed off in December and I’ve done various media and press interviews about the new sites! 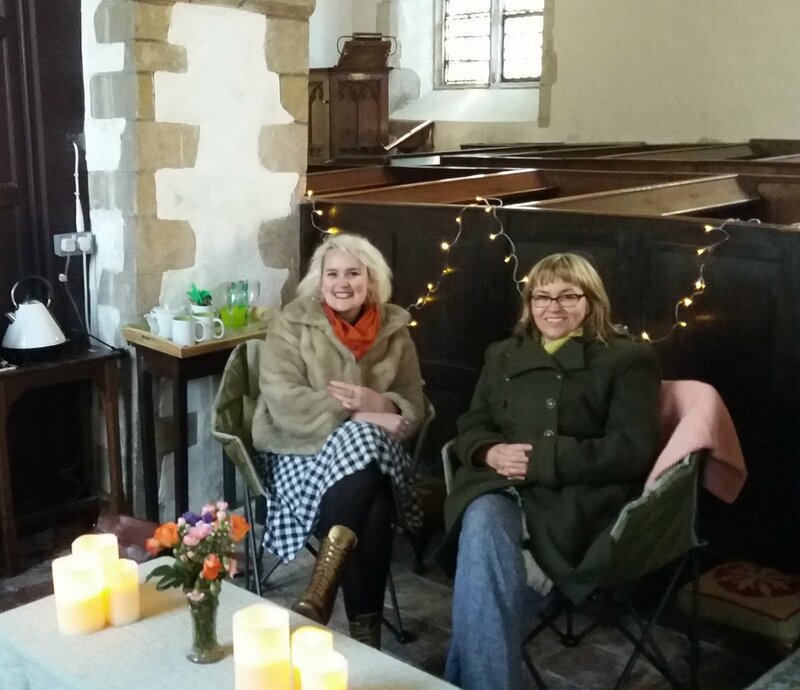 One of my favourites was just last weekend when we had a writer, Melonie Clarke, from The Lady Magazine stay over at St Mary’s Church, Fordwich in Kent. Although it was one of the coldest nights of the year, Melonie and her friend had a great time and came prepared with hot water bottles and extra blankets. I look forward to seeing the write up in the Easter issue, which is just in time for when we open our doors to Champers. 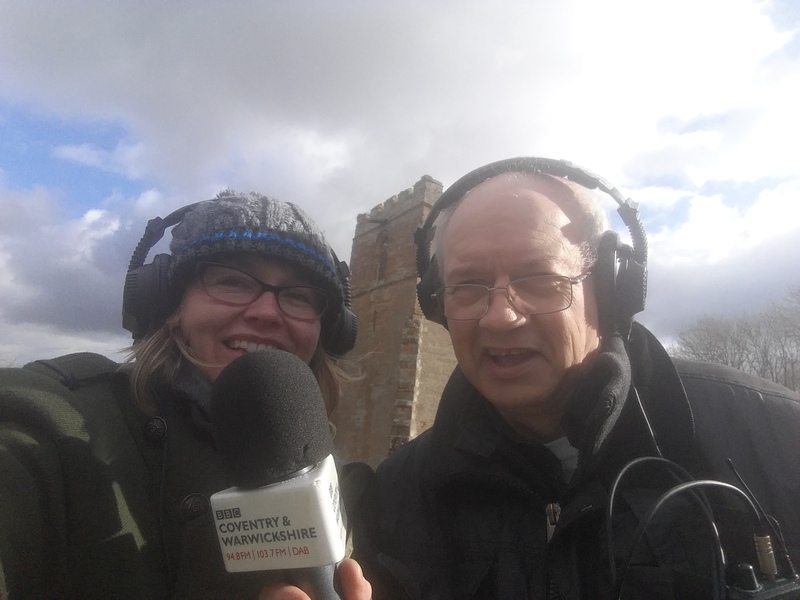 We’ve also been popular on some of the local BBC radio stations and so far we’ve been on BBC Somerset, Wiltshire and BBC Coventry & Warwickshire. It’s still a bit cold to be stood about in churchyards though, so I have to try and not let my teeth chatter when I’m talking! Have you got what it takes to be a ChampBot? My ChampBot colleagues are busy stock checking all of our Champing™ supplies and ordering new ones – its amazing how many tea bags you Champers get through! We’ve also been getting the trusty Champ beds and chairs out of storage, ready for lots of eager guests to make their cosy space. Also back by popular demand are the battery operated candles that provide heaps of atmosphere in the darkness of a country church. So realistic are these candles in fact that some people, who shall remain unnamed, have even tried to light them – remember, there is a button underneath to switch it on! 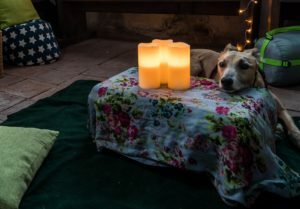 The candles are fake, but the dog is real. Don’t forget, Champers, that you only have until 1st March to book and get 10% off your stay. What are you waiting for?! Until next time, I’ll get back to testing out some of these cushions. It’s a tough job but someone has to do it.